Picking up from my previous column, the same issue of “The Billboard” that advertised Doris Day’s version of “Your Mother And Mine” (from Disney’s Peter Pan) also saw RCA Victor weigh in with their covers of songs from the score of the upcoming animated film. This time, instead of the scattershot approach used for the songs from Alice In Wonderland, RCA decided to give the songs that they were going to cover to one artist. . . Hugo Winterhalter. 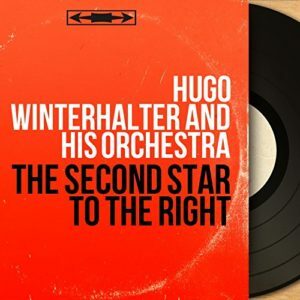 During the intervening twenty months or so, Hugo Winterhalter had become something of a name at RCA Victor. He had his name on several hit records, including such instrumentals as Leroy Anderson’s “Blue Tango” or Bernie Wayne’s “Vanessa”. He also featured vocalists on more romantic numbers such as “Somewhere Along The Way”. RCA issued two discs at the same time. On 20/47-5092, customers could buy Winterhalter’s versions of “Second Star To The Right” and “Your Mother And Mine”. The former song features a mixed chorus, which was a frequently-used device on Winterhalter’s discs of the time. On 20/47-5093 (like its mate, available on both 78 and 45 RPM speeds), the Winterhalter group of picked musicians and singes did “You Can Fly!” and “Never Smile At A Crocodile”. The various choristers got to do a sparkling version of “You Can Fly”. As for the admonition about not getting too chummy with a saurian–Hugo gave that to a baby-voiced singer named Judy Valentine. Miss Valentine had a middling career, doing nightclubs, what was getting to be left of radio, and the occasional record. She may have done some cartoon voices, or else she must have appeared on a local “Bozo the Clown’ show. At least, “Never Smile. . ” was also eissued in RCA victor’s “Little Nipper’ of children’s recordings. Over the next few weeks, various other artists tried their tonsils out on the’ “Peter Pan” tunes–especially as the film went from its ‘roadshow’ engagements in he Big City, to the “neighborhood houses”, where common folks often would go to see a movie. Ernie Rudy led his dance orchestra into a version of “You Can Fly”, issued on Coral 60920. It didn’t go anywhere. Columbia went to this well again, and dipped out “Never Smile At A Crocodile’ and ‘Following the Leader’ (39953) by The Paulette Sisters. This trio of harmonizing girls was one of those acts that could never get the one big break. . . the one hit record. . . that would put them over. They were “discovered” by Connee Boswell–who should have known something about sister acts, coming out of a particularly famous one herself. Somebody down in the Antipodes must have remembered this version of ‘Never Smile. . .”–it was used on the soundtrack of a 2007 Australian horror epic called Rogue–about a killer mega-crocodile. And lastly, Capitol issued two of the songs from the “Peter Pan” score–sung by one of he biggest stars of stage, screen, radio and television. Jerry Lewis had, along wih partner Dean Martin, become one of the most “bankable” people in Hollywood. Jerry got the chance to record both “Never Smile At A Crocodile” and “Following The Leader”. These were issued on a Capitol Childrens’ Record (Capitol CASF-3163).